Quilting is my Down Time: New glasses... New vision. Today the postman brought my new glasses. I didn't realise how bad my eyes were getting, my glasses were obviously not working. I sort of wish I didn't get new glasses as I can now see the flaws in my stitching. Well I am a little hard on myself! Me too - i have new glasses to pick up and now i am a bit worried about what my stitching is going to look like!!!! Lol!!! 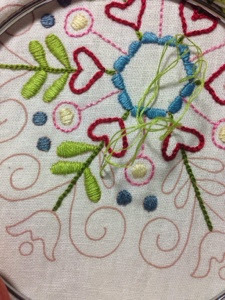 Lovely stitchery, looks good to me and I don't need new glasses! Your stitching is lovely..I'm due for an eye test again too..